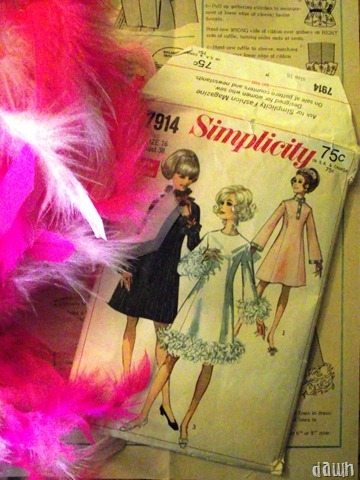 I don’t drag out my sewing machine very often. In the past couple of years my sewing has been limited to Halloween costumes, tote bags and one giant squid. But when your daughter who wears little other than oversized sweats and hoodies asks you to make her a dress from a vintage pattern, who can say no? not me! I’ve actually had it cut out since June but we are going to a movie premiere on Saturday so now is the right time to get it done. It went together surprisingly well considering (a) my rusty sewing skills and (b) the vintage pattern was size 16, it came together really well. 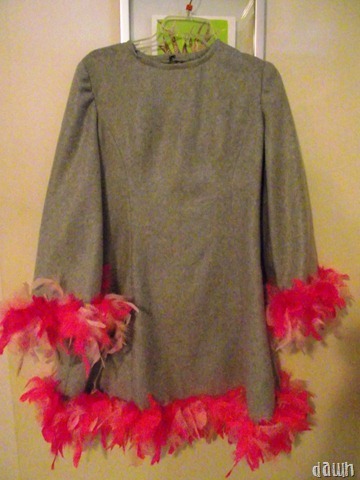 She picked the pink feathers to go with the pink and gray striped knee socks that she is going to wear with it. How adorable!